2013 Rittenhouse Sgt. Fury 50th Anniversary trading cards is the first premium pack Marvel product from the card maker. Highlighting the military-themed Sgt. Fury and His Howling Commandos, each pack guarantees a sketch card. The 2013 Rittenhouse Sgt. Fury 50th Anniversary base set has 30 cards. Three are in every pack. Each uses images from the comic's early run from the 1960s. Each pack also has one of nine different Character Cards. These spotlight Nick Fury as well as eight other members of his squad. The sketch card checklist has more than 50 different artists contributing. Collectors can expect lots of different characters and styles. 2013 Rittenhouse Sgt. Fury 50th Anniversary has two levels of incentive cards as well. Those who buy two 15-pack boxes get a painted sketch card done by either Matt or Mick Glebe. 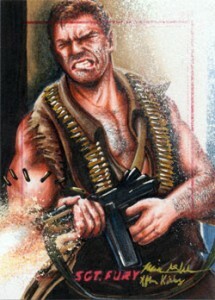 The four-box incentive is a water color sketch card from Mark Texeira, whose work has been featured in dozens of comics including Wolverine and The Punisher. Like Rittenhouse's other premium pack products, Sgt. Fury 50th Anniversary focuses on the "hits" aspects that might be found in a traditional box. But with fewer base cards and less packaging, the cost is a little less. It also limits the number of excess sets on the secondary market. 2013 Rittenhouse Sgt. Fury 50th Anniversary has a print run that's limited to 99 boxes. Rittenhouse SGT. Fury Marvel Sketch Card - Red Skull by Mick and Matt Glebe! SGT FURY & HIS HOWLING COMMANDOS SKETCH CARD SKETCHAFEX ARLEY TUCKER "ARTURO"
The following artists are working on the set.